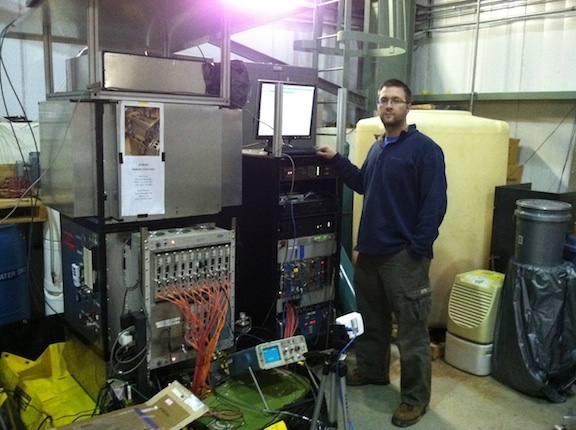 IU nuclear physics and CEEM postdoc Robert Cooper has been awarded a Fermilab Intensity Frontier Fellowship for Fall 2014 to support his development of a low-energy neutrino source facility at Fermilab. The future facility would provide an intense source of 10-50~MeV neutrinos to measure their elastic scattering on heavy nuclei, providing insight on dark matter, supernovae, and nuclear physics. One of the challenges in the design of this facility is to understand the ubiquitous neutrons that can overwhelm the desired neutrino signal. To measure the rate of these neutrons, Robert will employ the CEEM-built SciBath detector along with his expertise in neutron physics. The final product of this endeavour will be design of the neutrino shielding needed for this neutrino facility. You can find a PDF with more information on his research here. Please contact the CEEM at (812) 855-9365 or bl-ceem-offuse@exchange.indiana.edu to obtain information contained in the PDF above in an accessible format.